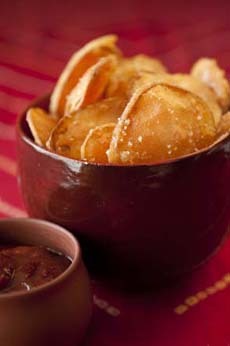 Beer Batter Sweet Potato Chips: Slice ‘em, fry ‘em and enjoy them with spicy ketchup (photo courtesy Maya Kaimal). What to serve with a cold beer? Why, beer-batter sweet potato chips. This recipe, from Chef Maya Kaimal, has an Eastern touch: rice flour instead of wheat flour (bonus: it’s gluten free), and spicy ketchup. 2. HEAT oil in a wok or 4-quart pot over medium heat, to 350°F. 4. DIP the sweet potatoes in the batter. Use a fork to transfer the slices to the hot oil. Fry the chips for a total of 2½ minutes or so, turning once or twice. The coating will be thin and crispy and only very lightly golden. 5. USE a wire skimmer or slotted spoon to transfer to the slices to paper towels. Sprinkle lightly with salt. Continue until all sweet potatoes are cooked. Serve hot with spicy ketchup. Chef Maya sells her own spicy ketchup, and there are others on the market: from Tabasco, Huy Fong (with sriracha) and other brands. Or, do what we do: Add hot sauce to your regular ketchup. You can make the it sizzle as little or as much as you like.